From the Latin word equester, we get the word equestrian, meaning a person who rides horses, or is mounted on a horse. In the broadest sense of the word, if you have ridden a horse, you can be considered an equestrian, although we have come to think of the word as meaning a trained or skilled horseman. Regardless of your degree of horsemanship, horseback riding should always be safe and enjoyable, and there are ways to make that possible. There are many areas of horsemanship to learn, and if you do proper research and preparation, you will soon know what to do in almost any circumstance. The first step you should take toward effective horsemanship is to educate yourself about horses in general. Knowing the traits and nature of a horse will go a long way toward interacting with horses and gaining their trust. Horses by nature have a distrust of man, and need to be approached calmly and put at ease, as they have a nervous system similar to a cat. If you don’t know the horse, it would be wise to spend a little time gaining his or her trust before trying to ride. If you can know how a particular horse was trained, and whether it has certain fears or habits, that would be helpful in deciding if you want to ride that horse. The only way you can know, of course, is if the owner or trainer is available to tell you, such as in a riding stable, where you may go for riding lessons or pleasure riding. Usually the horses in a riding school are trained well enough to accept any rider, but the more you can understand a horse and form a bond between you, the more enjoyable your riding experience will be. Just as with any animal or human, trust is formed with kindness, gentleness and consistency. If you frequent the same riding stable often, or if you have horses of your own, they will come to know you and trust you, knowing they have nothing to fear from you. 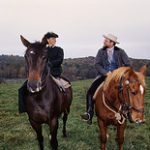 In order to enjoy the best riding experience, you should invest in as many riding lessons as you can reasonably afford. This is important for your safety as much as your enjoyment. Find an accredited riding school and check out the qualifications of the instructors. Ask about the safety record of the stables, or school. You will want to find a school that has an indoor as well as an outdoor riding arena. Ask to be shown around the grounds on your first visit, especially where the horses are stabled and their pasture area. The stables should be clean, and they should have a regular feeding and watering schedule, as well as a “play” area where they can romp and run when they are not working. No animal loves play more than a horse, which is surely where we get the phrase “horsing around”, meaning fooling around or accomplishing nothing in particular. These things are important because if the school is not professionally maintained, you will probably not get the best riding instructions either. > Before you mount a horse, be sure the saddle is snug, but not so tight that it’s uncomfortable for the horse. > Always mount from the horse’s left side. You can use a mounting block until you get used to lifting yourself into the saddle. > Never ride without a properly fitting helmet, and sturdy riding boots. > Place your left foot into the stirrup, take the reins in your left hand, and maybe a bit of the horse’s mane. > Place your right hand on the back of the saddle, never the horn, which can strain the horse’s neck; push or bounce a little on your right foot, keeping your body close to the horse, and swing up into the saddle. > Practice mounting without flopping yourself heavily into the saddle, which could startle the horse, or injure his back. > Place your right foot immediately into the right stirrup, trying not to kick the horse in the side. If you follow these tips for horsemanship, with the proper preparation and equipment, you should have a safe and enjoyable horse riding experience.